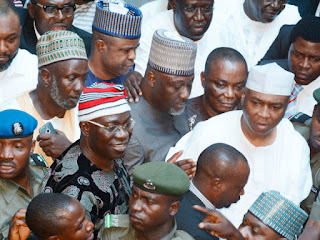 Some members of the Senate’s self-styled Unity Forum who have expressed intention to testify in court against the senate president, Bukola Saraki, and his deputy, Ike Ekweremadu, in the ongoing forgery case, face suspension, it was learnt on Wednesday. Dino Melaye, the senator representing Kogi west, suggested the punishment during an executive session on Tuesday, and the leadership of the house appeared to be in favour of the proposal. Mr. Melaye said the action of senators was capable of inflicting irreparable damage to the sanctity and integrity of the National Assembly, said sources present at the closed-door session. Senators Kabiru Marafa, Suleiman Hunkuyi, Ahmed Lawan, Ajayi Borofice, Gbenga Ashafa and Abdullahi Gumel are joining other witnesses to testify against Messrs Saraki and Ekweremadu. They all opposed the emergence of Mr. Saraki as president. Mr. Melaye said the only way to instill discipline amongst senators was to punish those who tried to do the bidding of the executive at the expense of the legislature. The Kogi lawmaker said the only way they could deflect suspension was for the lawmakers to cease being a witnesses to the prosecutor and withdraw their case entirely. But Mr. Saraki reminded Mr. Melaye that a committee had already been set up and was expected to submit its findings to the Senate for action. A former senate president, David Mark, who led the committee that was liaising with the aggrieved lawmakers, said his report would be completed in two weeks, sources said. From the audience, sources said, a senator rose to inform the Unity Forum members that they were lucky they didn’t get suspended immediately, urging them to withdraw their suit before Mr. Mark concluded his work. Another senator, Barnabas Gemade, pleaded on behalf of the senators, saying it would be premature to suspend them while Mr. Mark was still engaging the lawmakers. If all Unity Forum senators, which also includes Remi Tinubu, are suspended, the PDP would have the majority in the senate and may move to take over the leadership of the Senate, sources said.